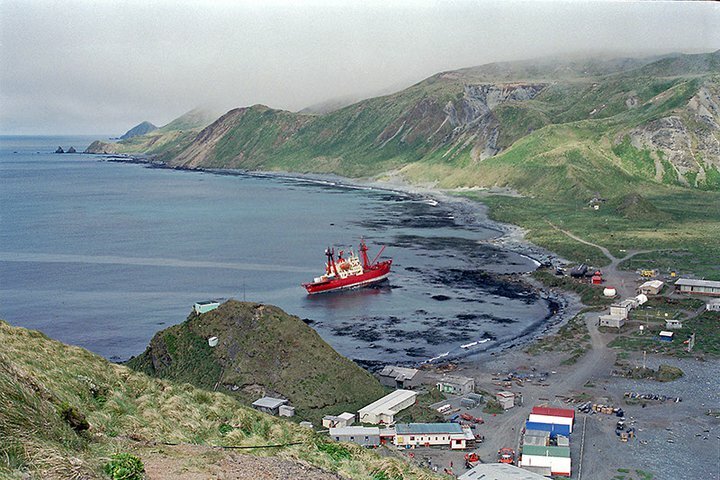 Nella Dan arrived at Macquarie Island on 1. December, anchoring in Buckles Bay off the island’s east coast by the permanent ANARE station in the northern part of the island. With the purpose of resupplying the station, Nella anchored about 0.25 nautical mile off shore. Among other deliveries, ‘tanker’ Nella Dan carried oil for the station’s upcoming season. The oil was pumped through an almost 1-km-long, small-bore pipeline. It was business as usual at Macca. A long winter had passed. Summer was around the corner, with the arrival of new personnel and preparations for the activities of the upcoming season. 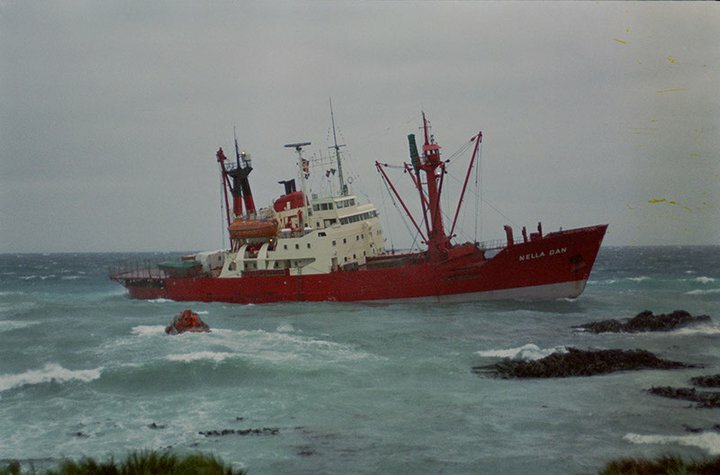 Crew members took turns going ashore, and LARCs shuttled back and forth carrying supplies and personnel. Macca and Nella were back together again, with the ease and comfort of familiar lovers. Home again. Some shores are simply fairer than others. Buckles Bay is among the fairest. On 3 December, the wind picked up from the south-east. At 06:00, second ship’s mate Anders Hanghøj Sørensen took over the watch. 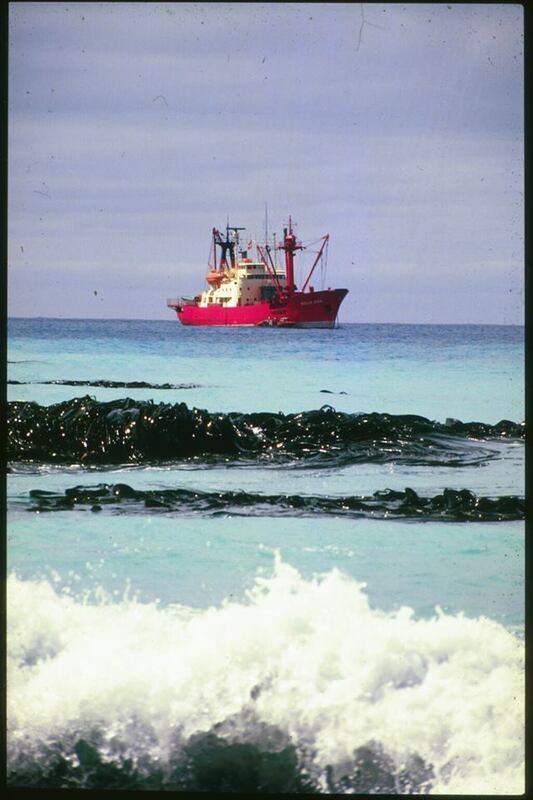 That morning, the LARCs continued the unloading process, and more scientists were put ashore. The delivery of fuel began via a long pipeline leading from the ship to the station’s tank installation on land. The weather gradually deteriorated, however, and the LARC operations were suspend in the mid-morning. First ship’s mate Magnus Olafsson took over the watch at 12:00. The afternoon proceeded without incident, and the crew continued to pump fuel oil ashore, aiming to complete the process early that evening. During the afternoon, the ship’s position was found to have shifted 0.03 nautical mile closer to land, but when the second mate took over the watch again at 18:00, the position was found to have stabilized. The mates on the bridge and the bosun discuss the situation at the changing of the watch. Heavy swells had been observed. The ship had been made ready; all that remained was to drop the fuel line into the sea, once the last of the fuel had been pumped ashore. The wind remained south-easterly, increasing to 8 on the Beaufort scale. The moon was waxing, and there was a spring tide. At 18:20, the second mate radios the tank installation to arrange the timing and procedures for the imminent completion of the oil transfer. The call was made from the chart room. Around the time of the radio call, several crew members and Captain Arne Sørensen observe through the windows in the salon that the ship is changing position and drifting. Throwing down his knife and fork, the captain runs to the bridge to take command. An engineer’s assistant who happens to be on the bridge is sent down to the engine room to find an engineer to power up the main engine, ‘Olga’. The anchor cable is found to be intact, and the brake is holding, which means that Nella Dan is dragging the anchor. The captain sends the second mate to the foredeck with two sailors, but before they get there, Nella takes the ground for the first time. 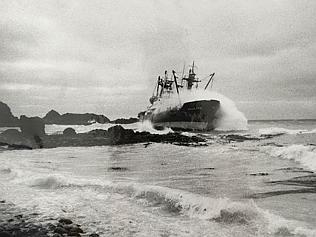 The windlass has reached its maximum capacity, and Nella takes the ground with every swell. The engine powers on. ‘Olga’ huffs and puffs. But it is too late. The captain calls up two LARCs from shore and begins the evacuation. Nella Dan has the sea athwart, with her starboard side towards the shore, which leads to severe heeling and jolts through the ship every time she strikes ground. Bosun Benny Strøm goes below together with the deck crew to check that everyone is safely out of the lower cabins, which are now flooding. After a tally of crew and passengers, the evacuation begins via pilot ladders from the starboard walkway. 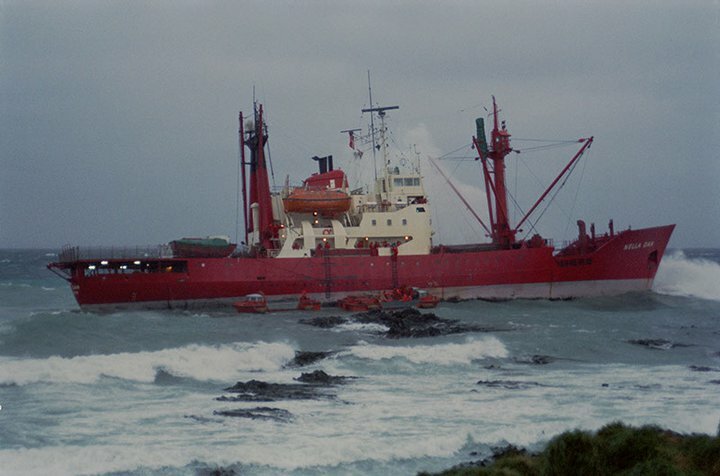 Both crew and passengers had put on their neoprene polar survival suits, but due to the ship’s sideways roll in the surf and the jarring impact against the rocky ground, the fuel tanks sprung a leak, and a spray of diesel shot up right in front of the starboard walkway. Everything was awash in diesel, and the neoprene suits became slippery like oiled eel. Diesel also got into some people’s eyes, greatly hampering the evacuation. The evacuation happens from the lee walkway facing the shore and the jarring against the rocks. Climbing down the pilot ladder and into the LARC requires tremendous caution and courage, as the amphibious vessel rises and falls 2–3 metres with every swell and impact against the rocks. Falling into the sea in between the ship, the rocks and the LARC would have posed a life-threatening situation. It is testimony to the outstanding skill of the two LARC crews that everyone is brought safely ashore. The second mate is the last to evacuate. The ship’s captain, chief mate, first mate, chief engineer, bosun and cook remain on board. Around 20:30, the evacuation is complete. The sound of the howling wind around the station buildings is now accompanied by the hollow booming sound of the waves crashing against Nella Dan, which is beached on the sandy shore below the station. 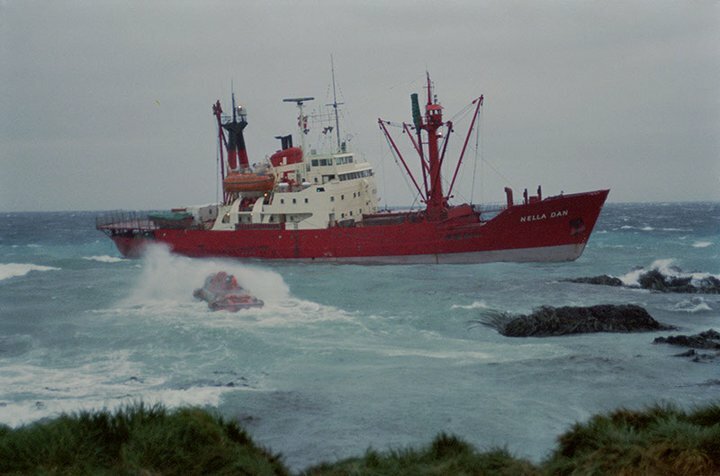 Grounding of Nella Dan in Buckles Bay on 3 December 1987. Interview of Captain Arne Jacob Sorensen. Investigation by C. W. Filor and T. M. Fitzpatrick. 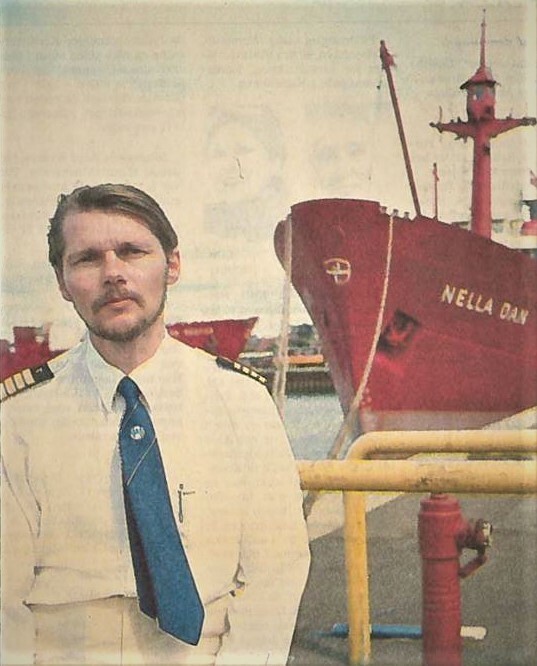 Transcript of the interview of Captain Arne Sørensen in Hobart on 29 December 1987, conducted in the presence of representatives from the shipping company J. Lauritzen and the Danish embassy. The official investigation was completed in March 1988 with this final report and its conclusions concerning the causes and circumstances of the shipwreck.